Emma Mostert, Rhodes University post-graduate botany student, Professor Craig Peter of Rhodes and Gideon Machete of the South African National Roads Agency Ltd (SANRAL) at the Botanical Gardens in Grahamstown where the Oldenburgia grandis has been relocated to. The South African National Roads Agency Limited (SANRAL) has teamed up with Rhodes University to save a rare, endemic plant species, Oldenburgia grandis, and has now brought this species home to help educate Grahamstown residents in the local botanical gardens. Oldenburgia grandis, an ancient member of the daisy family (Asteraceae), occurs mainly within the Suurberg mountain range between Port Elizabeth and Grahamstown, clustering on the rocky outcrops of the Witteberg quartzite or, nearer to Grahamstown, on hard sandstone outcrops. SANRAL initiated a transplant project of Oldenburgia grandis that grew along sections of the N2 where construction activity for the R900-million upgrading of the road would take place. 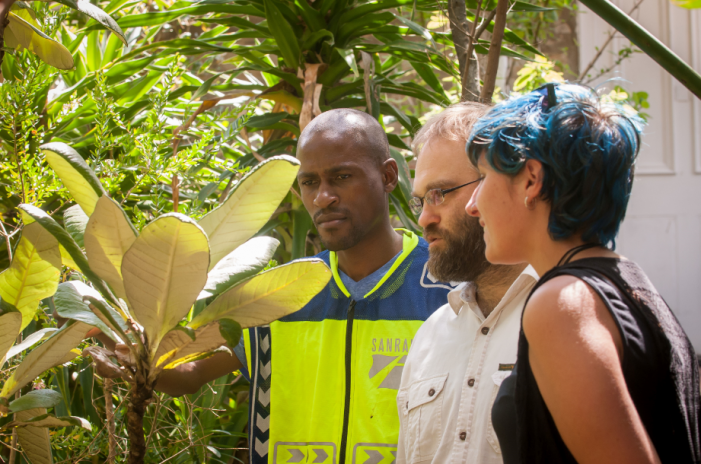 The plants have been transferred to the Makana Botanical Gardens, where local residents and visitors have access to the beauty of this species that grows on Grahamstown’s doorstep. In conjunction with the transplanting of the species, SANRAL also funded a botanical research project to provide new insights into the reproductive biology of this species. Before this research, carried out by Rhodes University post-graduate Emma Mostert, very little was known about the reproductive biology or transplantability of Oldenburgia grandis. The project is funded by SANRAL. Mostert’s studies focus on the ecology of the species, such as population structure and reproductive biology, including seed production, germination and pollination. “The study aims to answer questions about how the species functions, and its role in its environment. The study will also provide us with information that may help us to make informed decisions about the management of this species,” she said. Mostert describes the species as “a very strange plant that looks almost prehistoric, which makes finding out about aspects of its ecology fascinating”. Steven Robertson, SANRAL project manager, said it was standard procedure to conduct Environmental Impact Assessments (EIAs) before starting work on a road project. “SANRAL will always commission a botanist to identify plants of significant value or rare species, or insects and animals that need to be considered. Once the study is complete, then we design our work to have the minimum possible impact on natural resources,” Robertson said. SANRAL has also teamed up with Nelson Mandela Metropolitan University (NMMU) to conduct research on the contribution of national road reserves to conservation in the eastern portion of the Fynbos Biome, which forms part of the Cape Floristic Region, one of the country’s biodiversity hotspots. This is of particular importance in the Tsitsikamma area as most of the original fynbos has been converted to pine plantations or agricultural land. “The SANRAL approach to environmental management is an integral feature of the agency’s established record of corporate citizenship. Respect for the natural environment is an important goal for us,” said Simon Peterson, SANRAL Southern Region Manager. ”We strive to adopt the best practicable environmental management options in our operations, or to identify feasible alternatives. “SANRAL is committed to rehabilitating and returning our areas of operation to their original state, and we envisage these goals to be in support of the sustainability goals of respecting and maintaining natural assets,” he said.